Bundeena Library will reopen in the new Bundeena Public School Library in mid to late August 2010. The exact date for reopening is dependent on the delivery of the shelving that is being generously provided by The Department of Education. There are currently no return facilities at Bundeena however all Sutherland Shire Libraries items may be returned to any other branch library. Renewals can be done by ringing Sutherland Library or via My Account or renew loans on the library website. Sutherland Shire Libraries have been asked to take part in a trial of a federated search tool which will conduct a single search across the library catalogue and some of our major database subscriptions. We invite our library website customers to try out this search tool and leave us a comment. You must have a valid Sutherland Shire Library card to access this trial. The trial is a joint initiative with The State Library of NSW and EBSCO, a major provider of online information. Library Week 2010 Menai, originally uploaded by Sutherland Shire Libraries. Mr Ray McInerney was very happy patron last week when he won the Library Week hamper at Menai (seen here receiving his prize from Bronwyn). The Wrap With Love 2010 Knit In was held early this year. 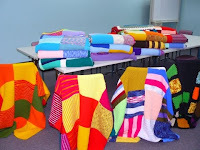 Shire knitters and groups had been busy knitting squares and making them into wraps to be sent to people around the world who are affected by the cold. Thanks to those knitters who joined us at their library and to those who brought in completed squares and wraps. 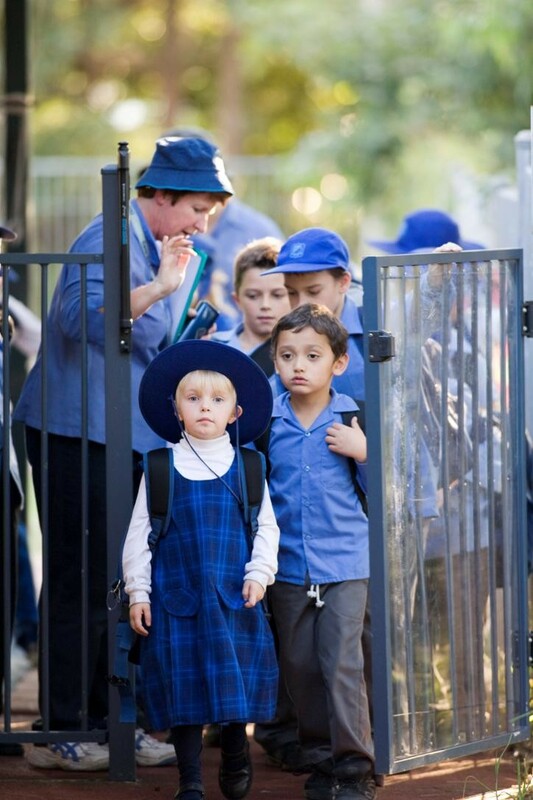 A special thank you to Jannali/Como Rotary Club who brought in the very colourful wraps shown here in the photos. If you love to knit or crochet or you would like to learn Cronulla, Engadine and Sylvania Libraries hold regular knitting groups. Knitters or would be knitters of all levels of abiltiy and ages are invited to meet in a relaxed, welcoming and social setting. 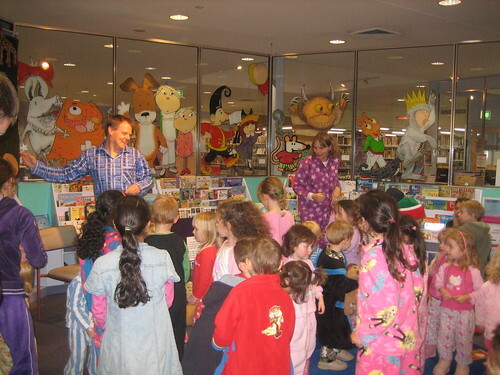 Menai Pyjama Storytime 7, originally uploaded by Sutherland Shire Libraries. Just a quick update. On the night of Monday 24th Menai hosted a Night time Storytime. We had a great turnout with 30 something eager Pyjama wearing children. We all enjoyed the songs, the stories, a film, and Kelly's unique Dream Catcher craft. A fun night! To acknowledge Refugee Week 21st June - 26th June, Sutherland Library will be showing the films from the Australian Refugee Film Festival. These films will first screen on the 19th June, at the Uniting Church, 264 Pitt Street, Sydney 2pm - 5pm to mark the opening of Refugee Week. They are then coming to Sutherland Library! Starting on Monday the 21st June and continuing until Saturday 26th June, there will be 3 daily screenings at 10am, 2pm and 6.30pm Monday to Friday, and 2 screenings on Saturday at 10am and 1.30pm. Nine short films with a total runtime of 2 hours & 12 minutes, provide insight into a variety of aspects of being one of the 9.2 million refugees across the world today. In the process of or thinking about toilet training your toddler? Would you like some easy to understand information and tips? Come along to Engadine Library and hear Catherine Conyngham talk about the signs of readiness for toilet training. Catherine is a trained Karitane Mothercraft Nurse, Triple P Facilitator, Certificate IV in Training and Parentcraft Educator. The theme for this year's National Cyber Security Awareness Week is Protect Yourself Online. Key messages and activities during the Week will put the spotlight on the the growing number of devices that we all now use to access the Internet, our increasing use of WiFi, the more complex range of transactions we do online, and as the result, our need for better security and more care about the information we share online about ourselves and others. For further information about some simple things people can do to protect themselves online, see Stay Smart Online.